You might remember me posting about the TV series My Cat From Hell a few weeks ago. It’s a great programme with cat behaviour expert Jackson Galaxy. Jackson also has a book out – Cat Daddy: What the World’s Most Incorrigible Cat Taught Me about Life, Love, and Coming Clean and I read it last week. The book isn’t just a book about cats, it’s Jackson’s story about how cats (and one in particular) helped him change his life. Jackson describes himself as broken; he was an addict and in a pretty bad place in life. His quest to improve the life of his cat Benny helped him to improve his own life and it is a very touching story. The last chapter had me in floods of tears and I don’t think anyone could read it without crying so be warned, you’ll need tissues! I really admire the bravery of Jackson to write about such deep and personal issues and I’m glad he has. Before cats came into my life, I was broken. I was in such a dark place and was going nowhere. Pixie turned my life around, gave me something to live for. Looking after a tiny little kitten was what I needed to show me that life could be good. She filled my days (and still does) with love and fun. I’m really not sure I would still be here without Pixie, she saved my life. It’s because of this that I can relate to this book so much. So whilst there are lots of great tips about cats and their behaviour in the book, if you’re looking for something that’s just a guide to cats then this is the wrong book for you. But, if you want to read about how these tiny little animals can have such huge impacts on the lives of people then it’s a great read. I am sure so many of you with cats can relate to how much cats enrich and improve our lives and this book shows how they really are little miracles. Thanks Beth for the review, it’s very touching! Thanks for the review, I will have to give it a read. I recently finished A Street Cat Named Bob which is another touching story. Cats, and animals in general, really can turn people’s lives around. Yeah, “A Street Cat Named Bob” should be very touching, I saw a trailer about the story behind it. I fully agree, animal are amazing creatures! Thank you for the review. I’ll definitely need to go buy it. I love Jackson’s show on tv. Another awesome book to read is Dewey The Small-Town Library Cat Who Touched the World. There’s also Dewey’s Nine Lives. Both are filled with true stories. Hi Beth, up until recently i hated cats and even felt like harming them whenever i kept finding numerous cats in my Garden. I had become so angry and bitter about so many issues that cats in my garden among other things had such a devastating effect on my life that i just wanted to harm them. Now all that has changed thanks to therapy. I have still a long way to go in terms of anger management etc. But i have now discovered that a cat has been living in my garden and appears somewhat feral. Things have changed for me as i now realise the fault does not lie with the cats but rather the cats owners. I have sought to befriend this cat and even allow it to come into my house where it occasionally sleeps on a chair in the lounge and also eats the cat food i have purchased for it. However it does not show affection and it does not like sudden movements or load/sudden noises which makes me think it has had little or no actual human contact. Being held, stroked etc. But will eat out of my hand, lick my fingers or put its front pas up on my lap when attempting to obtain a titbit. I miss the cat on those odd days when for whatever reason, it does not show up. Perhaps he is a scavenger who occasionally visits other peoples gardens where he can get a different meal occasionally. Who knows? 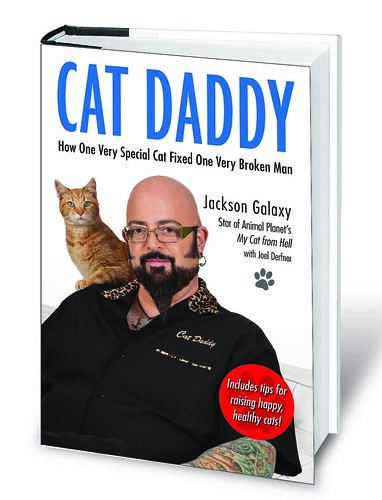 Thanks for the review of the wonderful jackson Galaxy cat behaviourist. Keep up the good work beth great site too.